THE relationship between Sibanye-Stillwater and the Association of Mineworkers & Construction Union (AMCU) took a decisive turn for the worse today after the union called members employed at the firm’s platinum assets out on a secondary strike. Neal Froneman, CEO of Sibanye-Stillwater, said his company had been preparing for the prospect of a secondary strike at its Rustenburg operations in support of a near-two month strike over wages at Driefontein, Kloof and Beatrix, the firm’s gold mines. “Our South African PGM (platinum group metal) operations have been preparing for this outcome and as such have strike contingency plans in place to minimise the possible impact of a strike,” said Froneman in a statement. Sibanye-Stillwater said in a business update last week that strike contingency plans at the gold mines had helped minimise the impact of AMCU’s nine-week long strike (at that time) with gold production coming in a whisker below adjusted guidance. It’s thought the update enraged AMCU president, Joseph Mathunjwa, and was a factor in his calling the secondary strike. Commenting today, Froneman said Sibanye-Stillwater’s profitability would also be supported by strong palladium pricing from which its US PGM operations was benefitting. Sibanye-Stillwater was also seeking legal advice regarding the secondary strike. Whilst deemed legal in terms of the Labour Relations Act, secondary strikes are only conducted within “… constrained parameters and such strikes are not automatically lawful or reasonable,” the company said. In a separate development, Sibanye-Stillwater and Lonmin announced today that they would extend the long-stop date for completion of Lonmin’s takeover by Sibanye-Stillwater. This was after AMCU filed an appeal against the transaction with Competition Appeal Court of South Africa (CAC) on the basis that the takeover would result in significant job losses. “In light of the appeal before the CAC, Sibanye-Stillwater and Lonmin have agreed, with the consent of the Panel, to extend the Longstop Date for the scheme to become unconditional and effective from 28 February 2019 to 30 June 2019,” it said. “Sibanye-Stillwater and Lonmin remain fully committed to the offer,” it added. Sibanye-Stillwater currently employs about 17,400 people at its South African PGM operations, with AMCU representing approximately 56% of the employees at the Kroondal operations and 71% of the Rustenburg operations’ employees, the company said. Mathunjwa’s main power base, however, is at Lonmin. The secondary strike will only heighten tensions between AMCU and the company, especially as the two sides are due to begin wage negotiations in about four months’ time. “This could see AMCU out on strike twice in a year,” said James Wellsted, spokesman for Sibanye-Stillwater. The secondary strike is conducted on a no work, no pay principle as per the strike at the gold mines where AMCU employees already find that it could take up to three years to recover lost wages. “Although not surprising, the notice for a secondary strike at our South African PGM operations in Rustenburg is disappointing, as all stakeholders will be negatively affected, but more so those employees who will be exposed to the no work, no pay principle,” said Froneman. In the meantime, there’s the prospect that the gold strike may yet be judged unlawful in terms of Sibanye-Stillwater’s assertion that union membership at its gold mines was more than 50% with unions other than AMCU. In the event of this being proven, Sibanye-Stillwater would be entitled to extend its wage offer to AMCU which would have to accept it for face running an unlawful strike campaign. Wellsted said there was a meeting with the Commission for Conciliation, Mediation and Arbitration (CCMA) on January 16 to discuss the process of union membership re-counts after AMCU disputed Sibanye-Stillwater’s count. “We could be supported more by our regulatory authorities,” said Wellsted. It was more than a week has passed since the Labour Court asked the CCMA to conduct an independent assessment of union numbers at the gold mines of Sibanye-Stillwater. This article makes it apparent that the leverage that unions have been applying through the threat of impact on financials via strikes, has been substantially diminished. This appears to have been achieved through the diversification of mining outside of South Africa. 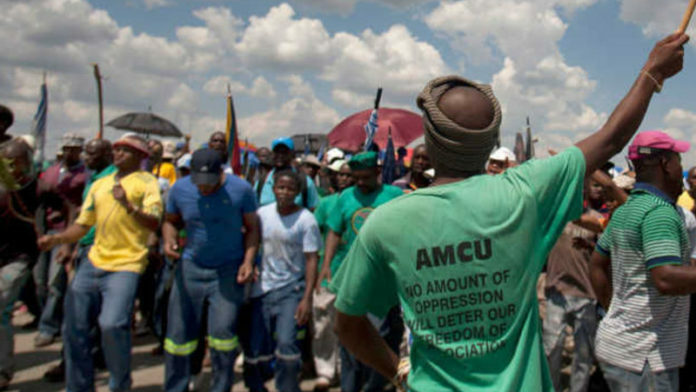 The leaders at AMCU are facing a severe backlash from their members if the secondary strike is declared illegal after not having received income for quite some time. Perhaps Joseph Matunjwa is more horrified than “enraged”. As the old adage goes, “In love and war, there are no rules” – and that goes double for this part of the world. Strikes in South Africa were never about anything other than showing of power. Why do the unions sign three year deals between elections, just to start striking in the year before or during an election? It is all about the alliances and possible seats in the government. 90% of the poor performance of the economy can be attributed to unreasonable demands from unions. I would actually enjoy it very much if the members finally see their “leaders” for what they are. amcu has been very aggressive from it’s inception and actually achieved nothing. During all this we get all the rosy stories from the president about employment and future growth, but this amcu leaders are busy breaking everything down. Why are the government not intervening. Don’t they realize what is happening? This union members are being bankrupt, but their leadership smile all the way to the bank! SA needs to brace itself for a bumpy year. Once the Lonmin and Impala retrenchments fully kick in, Rustenburg will come to a standstill. The unions, also as a survival tactic, will need to up the strikes, etc even if it will destroy their members financially. I get the feeling its go big or go bust for Amcu. Either way, the winner will be Anglo. They exited Rustenburg and got money for it. Their opencast operations are money-making machines and they will probably not be disrupted. The biggest loser will be Sibanye. Lonmin is an unmanageable company and with ongoing strikes at gold, Sibanye will not have enough hands on deck to deal with these production problems on all fronts. Watch out for Sibanye making plans to exit SA or at least to split the SA and international assets into different listed entities in order to manage risks. Amplats shares were among the best performers last year precisely for this reason, I imagine. As for AMCU, see the opinion piece I wrote today. The only PGM mine that will survive in SA will be Mogalakwena. With the expansion they will be able to supply the needs of the market when you include recycled PGMs. Sibanye will make their exit, bite the bullet for a while, but they will come out stronger. South Africa is dead, the ANC realizes this but they will cling to power through lies and deceit (and blaming colonialism for all the woes of South Africa) for as long as is possible in order to enrich the leadership of the ANC even further. They do not care about the poor (or even the middle class) people of South Africa….